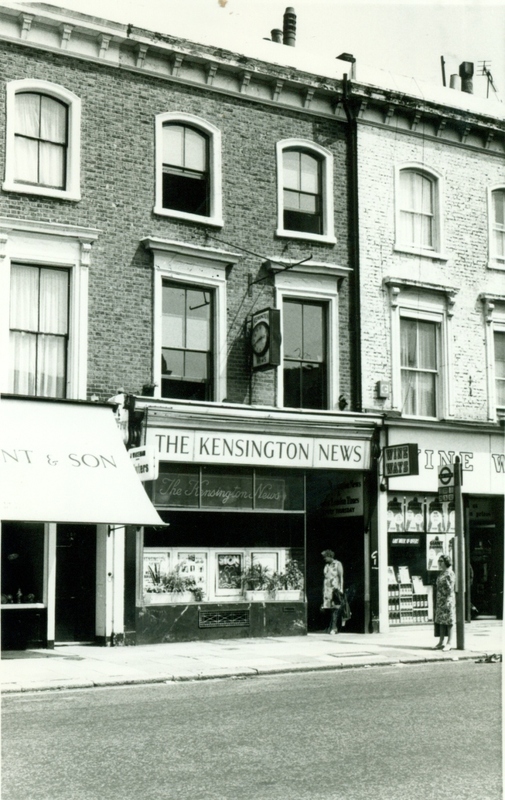 The home of one of Kensington’s local newspapers, (the other one was the Post although different names had been used over the years) at a time when the titles were independent. 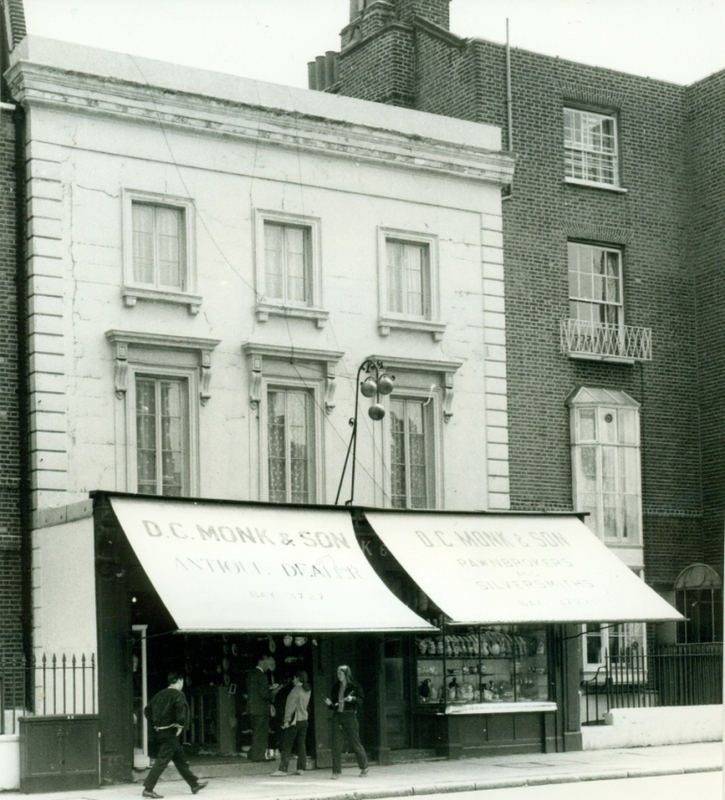 Below, D C Monk and Sons at 132-134. We actually starting to walk downhill at this point. 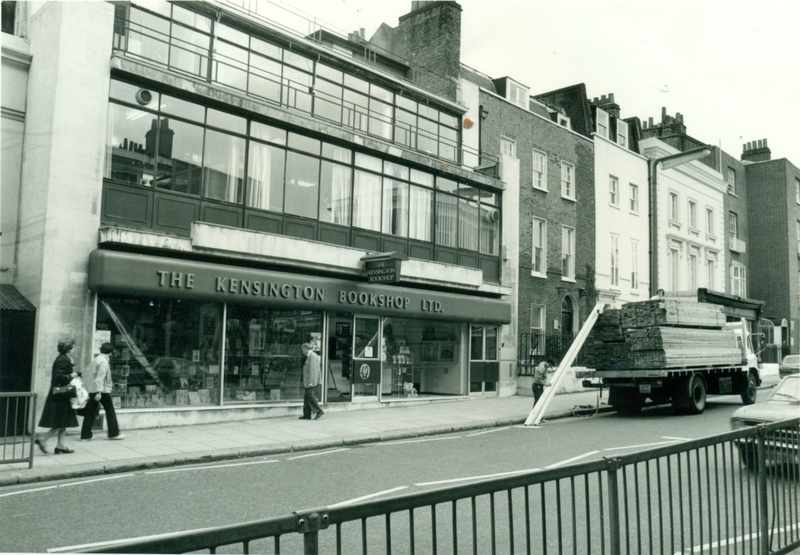 I have some recollection of standing outside The Kensington Bookshop, below, window shopping, and I think it was a general bookshop. I can’t recall actually going inside though. I have a feeling that I would have been passing by on my way to Kensington Library and would already have been tired from that slight upward incline. This was 1980 so I could easily have been in the picture myself. The shop was later taken by Adrian Harrington, a well know book dealer who, I met once, but who is sadly no longer with us. 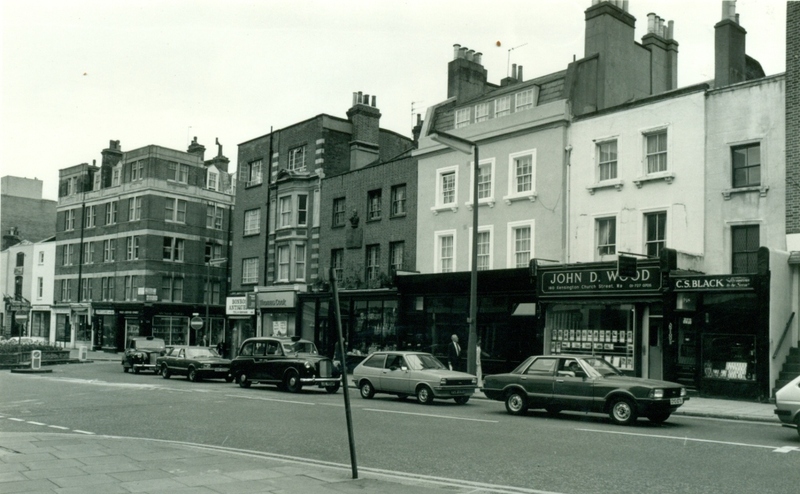 His brother Peter also sold or sells books and there are still shops bearing his name, one on the Fulham Road. 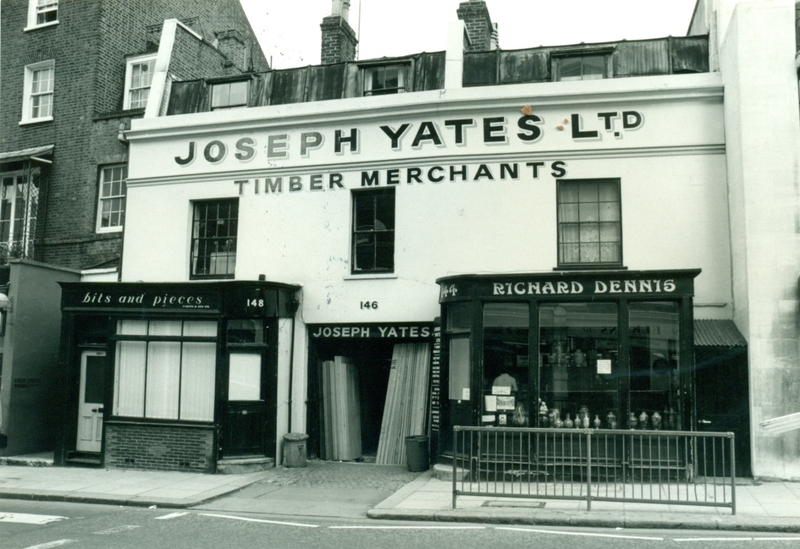 Farther along on the west side, another traditional style of shop, a large timber merchants, with two smaller businesses nestling under the main sign. Yes, at number 144 Bits and Pieces. Hello, are you looking for some bits? No today I thought I’d get some pieces. The big sign still exists. The traffic heading south in this picture has come out of Kensington Mall through the odd one way system which takes southbound buses past the top of Church Street so they can turn into a narrow street and turn again before they can enter the street. A barrier planted with shrubs and a couple of small trees (these days) keeps vehicles from going the wrong way, or is it to stop them entering a one-way street the wrong way? Traffic experts can tell me if they wish. From this point on Kensington Church street is northbound only and traffic is filtered either towards Central London or towards Shepherds Bush. Part of this building is a Post Office which is still in business. 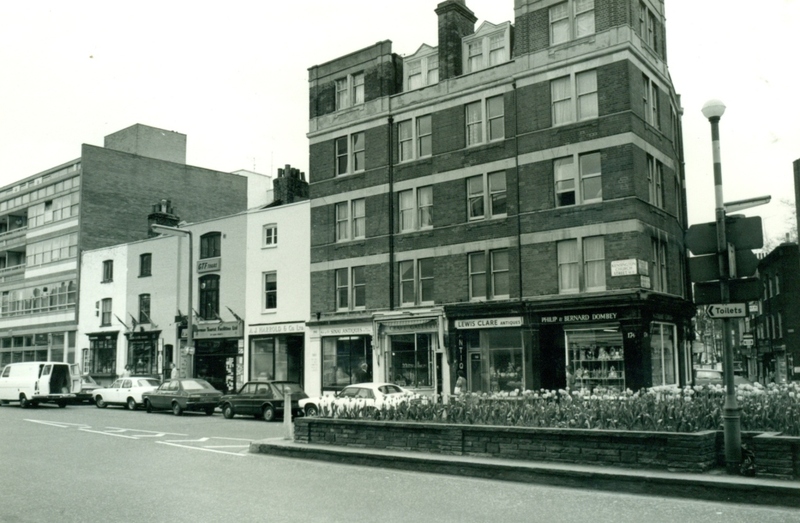 Here is the actual corner, and a glimpse of Notting Hill Gate. Before we take another look at Notting Hill Gate we need to go back to the west side of the street. 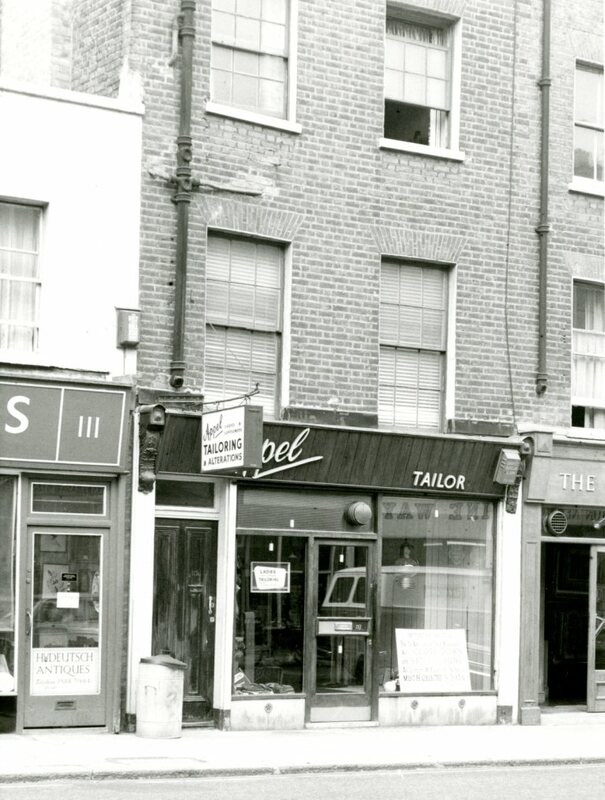 At number 113, Appel, a tailor. 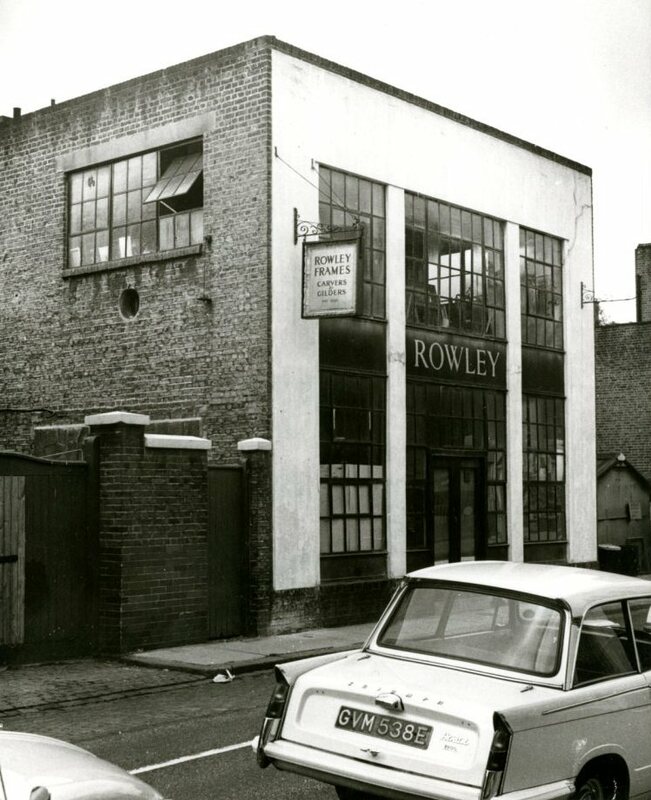 And next door to him at 115, the Rowley Gallery, another survivor. 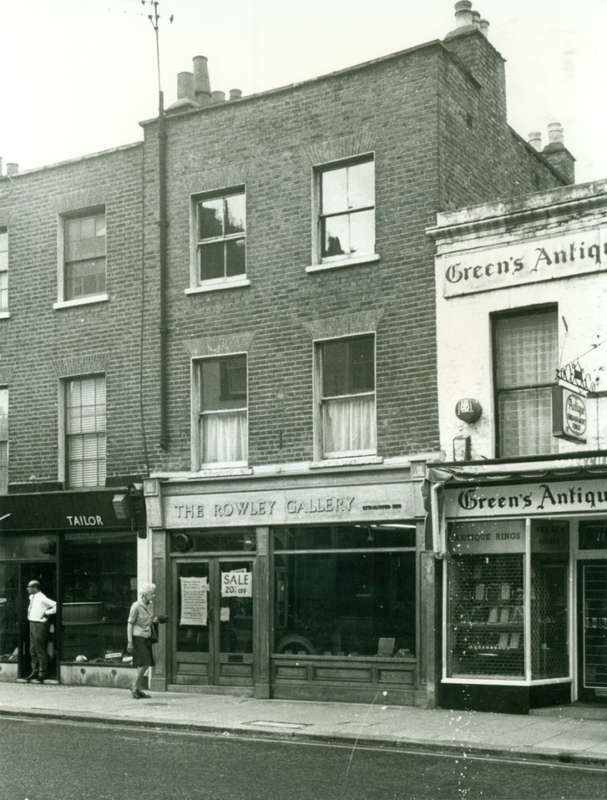 At this point the Gallery had a workshop nearby in Campden Street. At the end of that block is number 119, the Churchill Arms, one of London’s most attractive pubs. My personal bible of Kensington history, the Survey of London tells us that although the pub is now associated with Winston Churchill ( a Freeman of the Borough, among other things), the name may originally derive from the descriptive phrase “church hill”. But we shouldn’t quibble. Anyone who travels along this section will have noticed the new building rising behind boards and scaffolding between Edge Street and Kensington Place. It has one of those pointy designs over the glass facade. 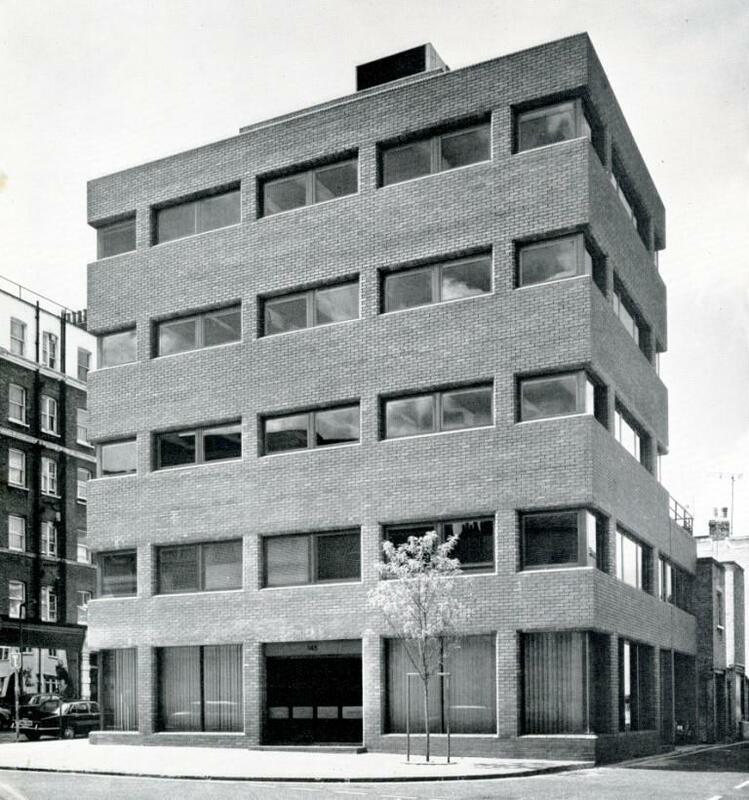 This of course replaces what I now have to call a “forgotten building” although many of you will remember the building which was there before, at number 145. I did wonder if this wasn’t simply a case of a new facade over an older building but Google Maps has that excellent retrospective street view (a boon to local historians and many others I should think) which shows the absent building in May 2015. 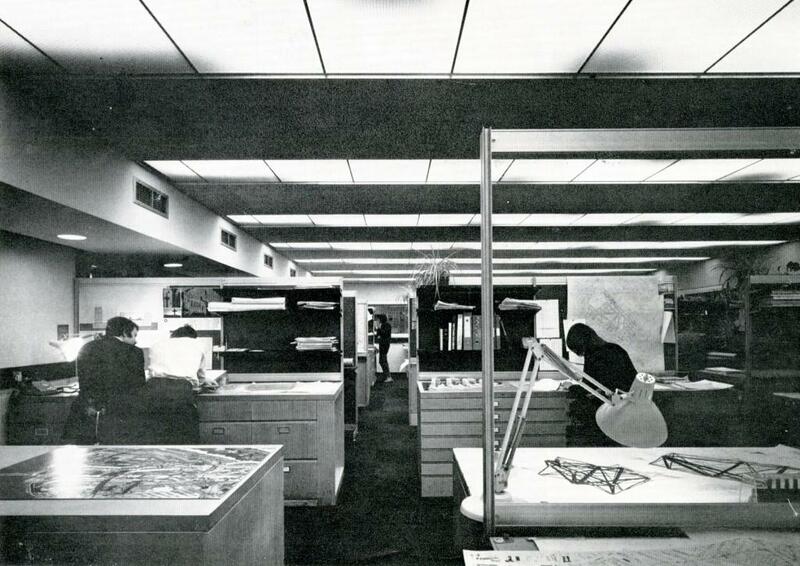 The offices of Chapman Taylor Partners, architects, newly built in 1973 and shown in Architectural Review. 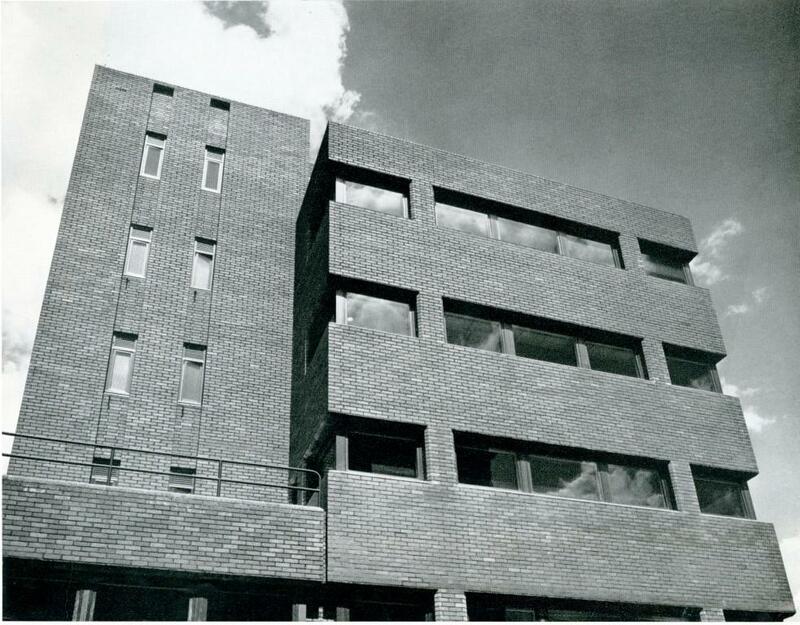 Not perhaps to everyone’s taste, but many of the buildings at this end of the street were now modern, and although it might be stretching a point to call it “charming brutalist”, it was not too overwhelming for the neighbourhood. 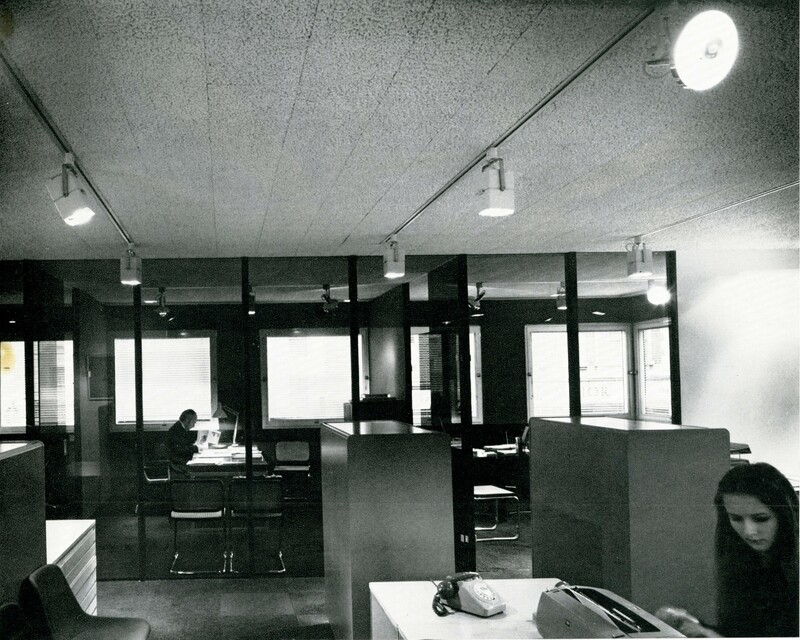 Below, some administrative offices viewed from “one of the secretary’s cubicles”. And there’s the secretary busy typing and waiting for the phone to ring as they did in the 70s. 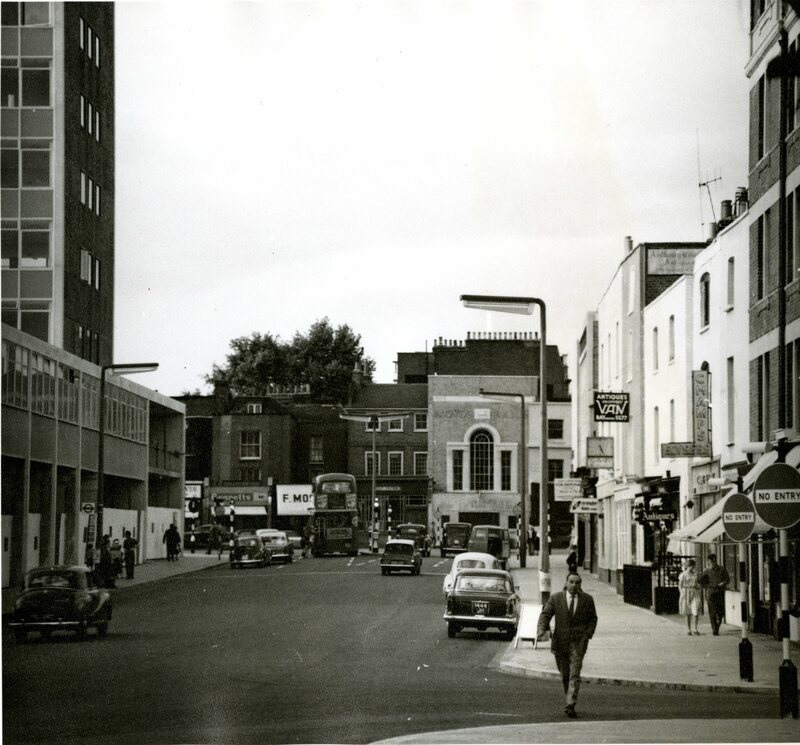 This 1961 picture shows a view of Notting Hill Gate, and the east side of the street as it had been 10 years before the 1971 pictures we’ve already seen. But let’s finish with a view of Silver Street which won’t be superseded by events. 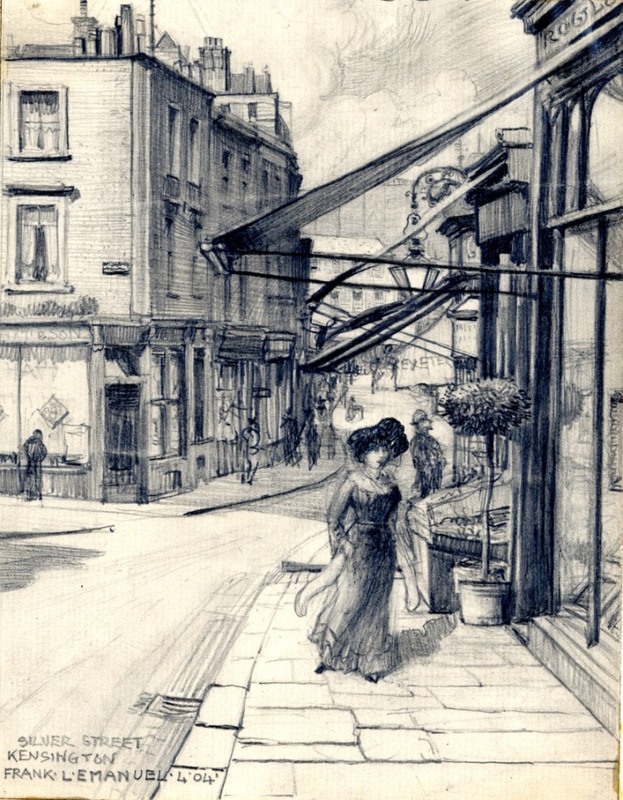 This pencil drawing by the artist Frank Emanuel captures the narrow version of Silver Street in the early years of the previous century. It’s always been one of my favourites. The figure of the woman is particularly good I think. I’ll come back to some of the artists who drew or painted this part of Kensington in a future post. But for now our journey is done. 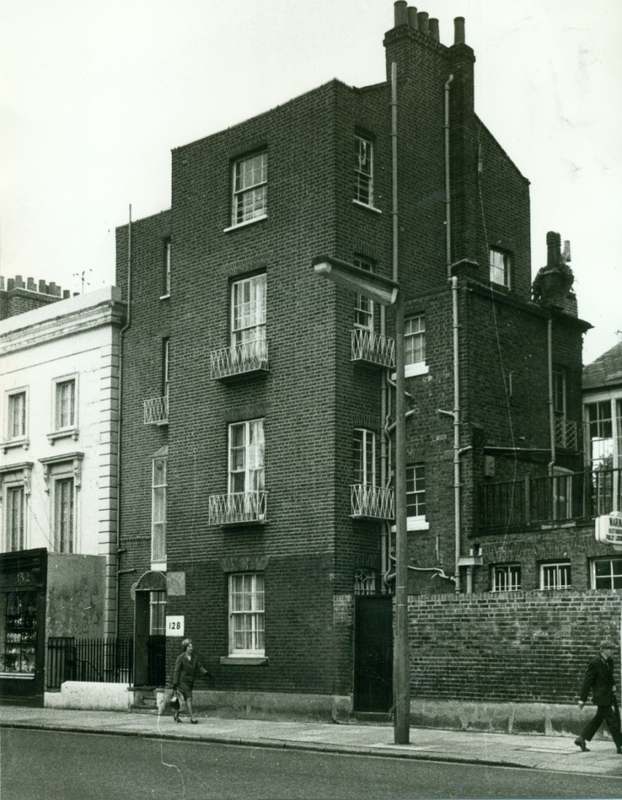 This entry was posted on Thursday, August 9th, 2018 at 7:03 am	and tagged with Kensington Church Street, Silver Street and posted in 20th Century, Kensington. You can follow any responses to this entry through the RSS 2.0 feed. If I remember rightly, the Kensington Bookshop took over the site from the Children’s Bookshop which was there for years. The Children’s Bookshop had moved to a shop at the entrance of Our Lady of Victories on the High Street. You’re right, it was the Children’s Bookshop and very good it was too. 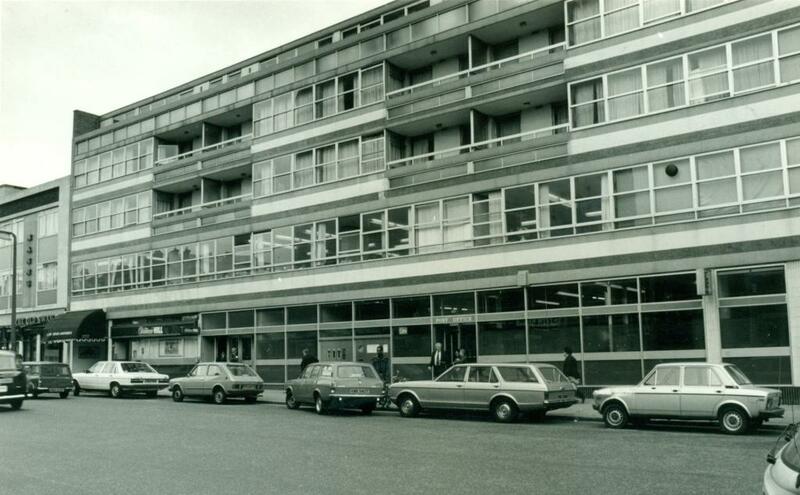 It’s newer premises on the High Street were much smaller and now it’s gone altogether. 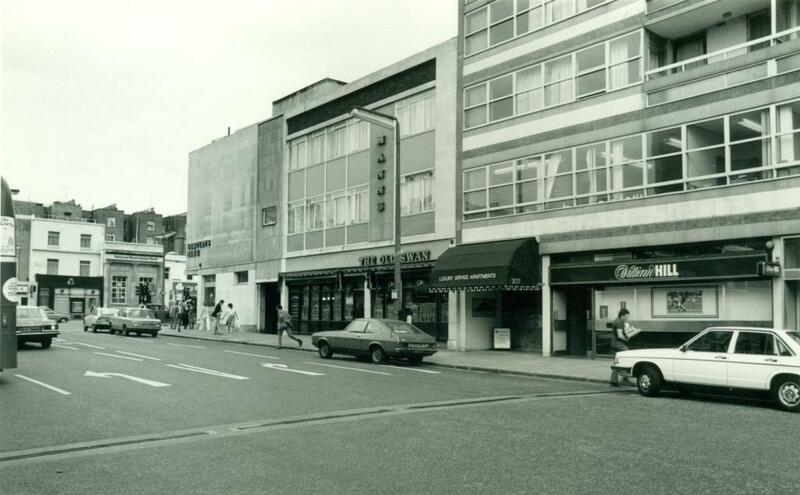 If memory serves me, what is now Waterstones, or pretty much thereabouts on that corner, at the top of K.Church St., was once a branch of Macfisheries. What happened to that retailer I wonder. The little one way turning coming South, were the traffic goes, called Rabbit Row, once had a wonderland puppet shop, also now gone. It sold everything to do with puppets and puppetry..
Not only are Dave’s blogs so well researched and presented, but his written accompaniments make them even more enjoyable. It’s like going for a walk with a friend who has a fund of stories and knowledge to share. Wotcha Dave,loved all the Church Street blogs,have a great vacation and I look for.ward to your refreshed return.